Like the other off-topic list... because why not! I've been absent for much too long. ...You're not outside during a storm but are tracking it on three kinds of radar inside. You're completely calm about 30 MPH winds battering your neighborhood. My co-workers HATE it when I do that. You once put a metal pole in your yard hoping, praying,(in vain) that it will be struck by lightning. You have a painful hernia in your "nether regions" and you have to lean on the balcony railing because of the pain but it's worth it because you see the wildest lightning display you've ever seen. This was at the end of August, 2008, a couple of weeks before my (first) hernia repair. This is me every time there's a severe weather event in my area. This is my setup. 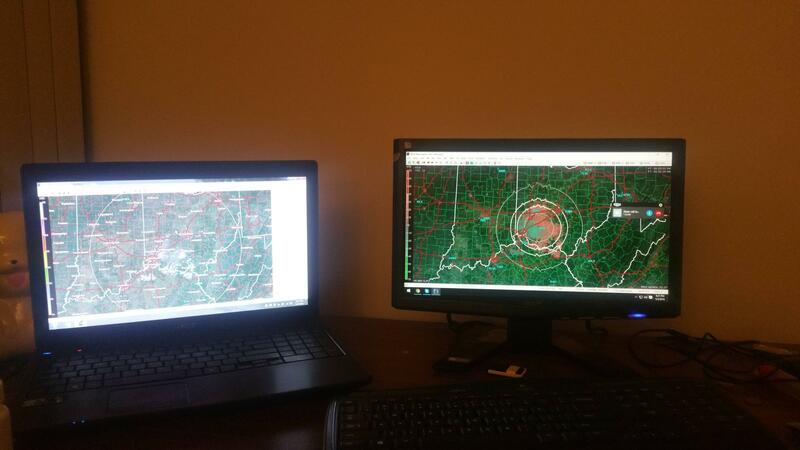 Having the two tabs that are always open be the NHC and the NWS. You have a weather station in your room and attempt to make forecasts off the data from it. This is what you want to go into when you get into college. The only time you'll get up early in the morning is if there is extreme weather. You are waiting for the next Cat 5 Hurricane in excitement. That was a small list but I felt like it needed to be on this old thread. A tornado warning actually gets you excited, rather than running for the basement. And you can't understand why weather reporters are replacing wind chill factor with "real feel". You have more than one weather radio. What about a radio collection? You have both a base and a portable weather radio, and you also have the NOAA frequencies programmed into your ham radios and scanners as well. Computer voice: This is NOAA Weather Radio, station WXJ-42 in Meriden. I used to have a Sony Walkman which had a weather band, along with TV sound for analog channels 2 to 13. OK...this was like 1998 or 1999 we're talking about. The only time you watch TV for more than 2 hours at any time is for severe weather events. Edit: Or 75% of total tv watched is weather related. Your English paper is based off of weather research from this or other times when a subject isn't given to you. Yup. On my computer, smartphone and smart TV. There, that defines me a little more. Same, but there were a couple that I left Un-tracked, such as TS Guchol in the WPAC. Don't we all. I track a good 80-95% each year though so I'm speaking generally. ...you hope a forecasted massive snow storm comes to fruition, despite knowing that (in my case) it will paralyse your city, and most likely ruin any plans you had that involved driving. So I did, but not as in-depth as I did some few years ago. Nice that you referred to Guchol as a tropical storm, I also consider so just because it was named, if the Joint Typhoon Warning Center (JTWC) was still in charge of naming storms in the Western Pacific it would have gone unnamed as they considered it no more than a tropical depression. The same holds true for the reverse (not named = not a storm regardless of what says the JTWC, save a few exceptions around Australia).